I'm just like everyone else... except for the part where I'm completely different from everyone else... and that's okay. Years after Rainbow Dash graduated, the world has moved on from the antics of her high-school days. Friends have left town, drifted away, drifted back in, some even disappeared entirely. But Rarity has been a constant in Rainbow's life since middle school. 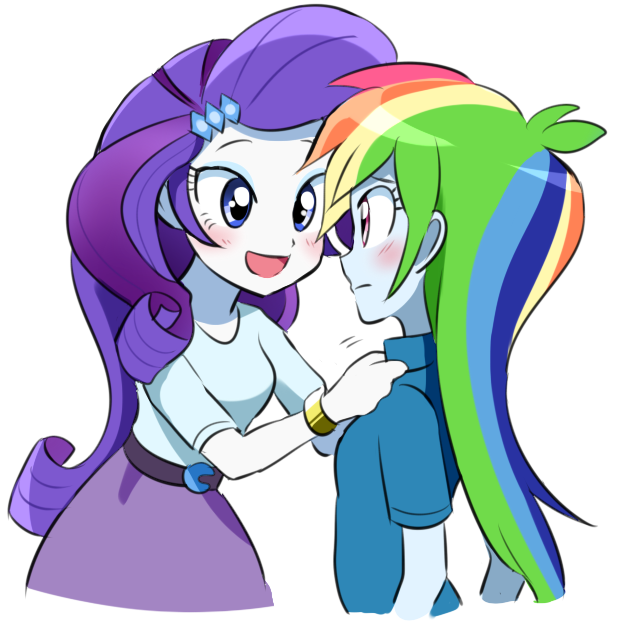 Now, as she comes to realize how important the fashionista is to her, can Rainbow tell her? Probably not. Talking was never her thing. She's gonna damn well try though. It has been two months since the invasion of Canterlot and Equestria is learning to heal. But even with Hearth's Warming around the corner, one pony can't find it in herself to be cheerful. Tempest Shadow, still haunted by the memories of her actions, is desperate to find a way to prove she's changed. Hoping to help, Twilight asks an old friend for assistance. One who'll force Tempest to face her demons, whether she wants to or not. This fic climbed to 2nd on the Feature Box on 11th December 2017! Cover art commissioned from the amazingly talented OverlordNeon! Who also helped me to come up with the title! Synopsis written with help from Novel Idea & Krickis! Revenge. It has been the only thing on Chrysalis’s mind during the months of her exile. What should have been her greatest triumph turned out to be her ultimate downfall. After months of waiting, she has at last developed a plot to win back the support of the changelings and take over Equestria: Run a dating service. Disguised as the lovely unicorn Cherub, she starts up her business, ready to reclaim what she had lost. However, she soon discovers that the dating world is not as simple as it appears. Realizing that she cannot do this alone, she is forced to seek help from the most unlikely of sources. Cover image created and permitted by FeliXao. A collection of short stories about the Dazzlings going through their daily lives of annoying each other and pretty much everyone around them. Cover art used with permission by the awesome thegreatcat14! Will be updated as more stories come to me. Sunset Shimmer has just graduated from Canterlot High School, and while that would normally be cause for celebration, it fills her only with a nameless dread as her friends begin to scatter to the winds to pursue their futures. With the latent magic of the human world contained and categorized and the Rainboom's idyllic days of schoolwork over, she finds herself without aim and listless, as though something important is missing from her life. Fortunately for her, Princess Twilight Sparkle might know what ails her. So. First time posting on the site after a VERY long period of lurking and reading and enjoying the tales this fandom can produce. To my surprise, I found a dearth of a certain subset of story that I wanted to read, and so I have done this, to put my thoughts to words. After all, it is said that one should write the story they want to read, yes? I've been inspired by a variety of stories like it that came before, and I hope to equal their quality. I'll try to update roughly once every couple of weeks; please be patient with me and I hope you give this tale a once-over. Pre-emptively tagging with AU, that I might diverge freely from what may come if needed. It is a new year for Sunset Shimmer; a fresh chance at real happiness with her five best friends and her girlfriend. But Sunset is constantly troubled by her uncertain future, and haunted by the consequences of her past. For her battle against Princess Twilight has drawn forth ancient forces with eyes on the last bastion of magic: Canterlot City. As darkness closes in, Sunset must find her light and guide her friends to defend their world against old rivals and legends best left forgotten, all while dealing with their ever-looming futures. But when graduation comes, what will Sunset Shimmer do? For she is still a stranger in this world, with or without her friends, and the road before her guarantees nothing. The page of Spectacular Tropes! It was a simple task: Deliver the package to a family in Eastern Baltimare, be back home by sundown. Derpy had flown the route dozens of times before with ease. But when a powerful, unforeseen storm strikes, the young mailmare is flung headfirst into an ungodly nightmare. For she is being hunted.